Developer(s): Riedel Software Productions, Inc.
Well, it’s been quite a while, huh? We kinda missed Halloween and we’re almost too late for Christmas. We do feel bad that we really haven’t had the chance to provide the quality content that keeps you coming back to this site, so we’re going to take this opportunity to rely on some cheap gimmick make good for our absence with a SIX-PART CARTOON EXTRAVAGANZA! And to kick off this spicy hot new series, let’s start with a true cartoon classic, Tom & Jerry for Super Nintendo, brought to us by Hi-Tech Expressions and Riedel Software in 1993! Ticket stubs are a quality way to travel. For those of you too young to remember, Tom and Jerry was a slapstick cartoon starring Tom the cat and Jerry the mouse, and built around Tom’s desperate yet always unsuccessful attempts to catch Jerry. Giant mallets abound, and for those of you a little older, this was the inspiration for the Itchy and Scratchy Show from The Simpsons. Now, you would think that a cartoon based around natural enemies and cartoony violence would make for a quality video game, but does it? Well, um…it’s not bad. 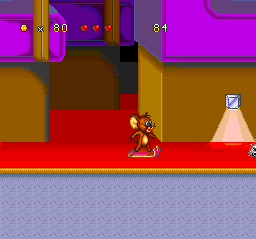 You play as Jerry, trying to make your way across the various stages dodging Tom and various other enemies like cockroaches, dust bunnies, mosquitoes, runaway toys, and anthropomorphic food items…y’know, all things that would ostensibly pose danger to a mouse. Jerry can fight back either by hopping onto enemies in the traditional platformer style, or by launching marbles along one of two trajectories: pushing Y launches a marble a bit above you and pushing A sends one on a path closer to the ground. This actually works quite well, allowing you to tag enemies a bit shorter than you or on an incline with relative ease, and most enemies can be easily dispatched with a single marble or a couple of bounces. You can also do a sort of double jump by tapping B as soon as you land from a first jump, but to be honest, I only discovered this in the last level because that’s the only time you’ll probably actually need it. This being a platformer, of course, there’ll be a good bit of jumping around, a couple leaps of faith, and the occasional platform that falls out beneath you with little to no warning. That said, nothing is particularly taxing here, and the overall difficulty level is at a surprisingly sweet spot given that I would imagine this was a game made for children; it’s not frustratingly difficult, but not so easy that you can coast through it blindfolded. 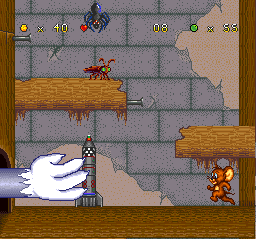 Jerry can also absorb five hits before dying, which can be boosted by picking up hunks of cheese, and extra lives are accumulated through cheese bits scattered through each stage, so there’s a good bit of leeway even if you get snookered by a falling platform or miss a key jump. I should also point out that Jerry handles a bit squirrel-y (mouse-y? ), and while it’s not quite deal-breaking, it’s something you need to be mindful of when landing on smaller platforms or trying to avoid enemies. Hitching a ride over a gap. However, you probably won’t need to stockpile too many lives, as this game is SHORT. There are only four levels, consisting of three stages each, with the last stage featuring a boss fight against Tom. The stages themselves are also extremely brief, with some of them capable of being plowed through in literally a minute if you’re putting a clean line together, leading to a game you can blitz through in under an hour, even accounting for a few deaths along the way. Again, this is a game most likely made for children, and kids probably didn’t care much what a game cost in 1993, but this game being sold for full Super Nintendo price when a kid taking a sick day from school could beat it by the time lunch rolled around seems kinda…weak. Ultimately, though, the biggest disappointment of Tom & Jerry is that, quite frankly, it doesn’t really feel like a Tom & Jerry game; it just feels like a basic, generic platformer that somebody stamped the Tom & Jerry characters onto. As I said, most of the enemies are bugs and toys and such, the locations for each level don’t really feel very authentic to the source material (most of the cartoons took place inside a house, and only the last level here takes place in a normal house), and there’s very little of the signature Tom & Jerry mayhem or humor to be found here. 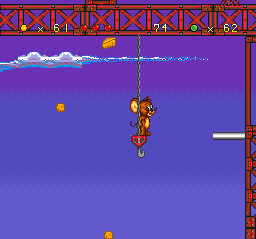 Only the last two boss fights feel anything like you’re playing a true Tom & Jerry game, and there’s only a couple neat spots in the rest of the game that make you think there’s something going on here underneath the basic hop’n’bop action. That’s a bit of a shame, too, because this game doesn’t look or sound half-bad. Character sprites are good-sized, and the Jerry character looks pretty solid and is decently animated, the levels are bright and colorful, and there are a few nice touches, like being able to bounce off of the handles of toasters or springs sticking out of furniture to propel yourself much higher than normal. On the flip side, while Tom himself looks pretty well-rendered, he’s basically not animated at all. His face just appears or disappears without changing expression or moving much, which kinda makes him feel like a cardboard cutout instead of a cartoon. Another minor annoyance in the presentation is that this is one of those games that likes to wait until you’re a good bit across the screen before the camera starts scrolling, which means you’re probably gonna take a few cheapo hits from enemies you didn’t see coming because you made the mistake of thinking you could run through a section at full speed. The sounds, while not particularly memorable, are also not particularly grating, although that might be more of a function of how short the actual game is; if I’d had to play this for longer than the short time it took to beat it, I might’ve noticed a lot more. 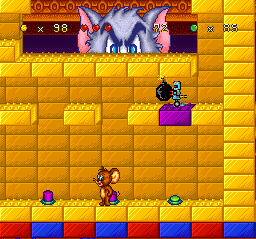 Tom & Jerry strikes me as the definition of an average Super Nintendo platform game. It doesn’t reinvent the wheel by any stretch, but on the other hand, it doesn’t try to do so but fail spectacularly. Then again, it doesn’t really do anything spectacularly, and the incredibly short length of the game as well as a visible lack of faith to the spirit of the cartoon itself take a bit away from the experience. If you were to track it down and play it, though, you’d probably have an…okay enough…time with it, but aside from pure curiosity or a stubborn desire to play any game that can be described as “perfectly adequate”, I can’t think of any reason I would recommend this one. Our cartoon extravaganza isn’t off to a bad start, but I do hope it picks up soon. Handles pretty well, just the right difficulty level for the target demo, pleasant enough to look at. WAY too short, has very little to do with Tom & Jerry as a cartoon. Looking into it after reading this, there are FAR more Tom & Jerry games than I would have ever expected (even one for GameCube/PS2?!). Also looks like this is one of Vince Desi’s (of Postal fame) first game production credits. Which seems fitting in a way. I hope you enjoyed your holidays with your families and had fun at the end of the year! By the way, Happy New Year, even if my wishes come with a slight delay! Judging by Uncle Dave’s review, this version of Snes looks like a fast-food dish; I guess, that would fall into the general neglect of the characters: if someone had invested half of the efforts dedicated to the Looney Tunes series (Taz Mania aside), maybe we would have had something better. Speaking of Tom & Jerry, I happened to play, many years ago, two games based on these characters: one on NES (the fruit of exchange with a classmate at the time) and one on Megadrive. Between the two, I remember that I preferred the 8-bit version, because the 16-bit, in my humble opinion, was made so-so, in terms of gameplay and controls … well, even the graphics could be made better. I should try again to play Tom & Jerry (and Tuffy) on Snes: at first, at the level of playability, it seems a little unsettling, but I would give it another chance. By the way, I read somewhere that Uncle Dave was celebrating his fifth year as a reviewer on JGR! (Sorry, I do not read you as often as I once did). Now it’s been more time, but I’ll still give you my best wishes and many other inspirations for future reviews! P.S. : So, it seems your cheap gimmick worked with me! Pardon, “unsettling” for Tom & Jerry (and Tuffy) is not the right term: I intended “messy/not particularly refined”.